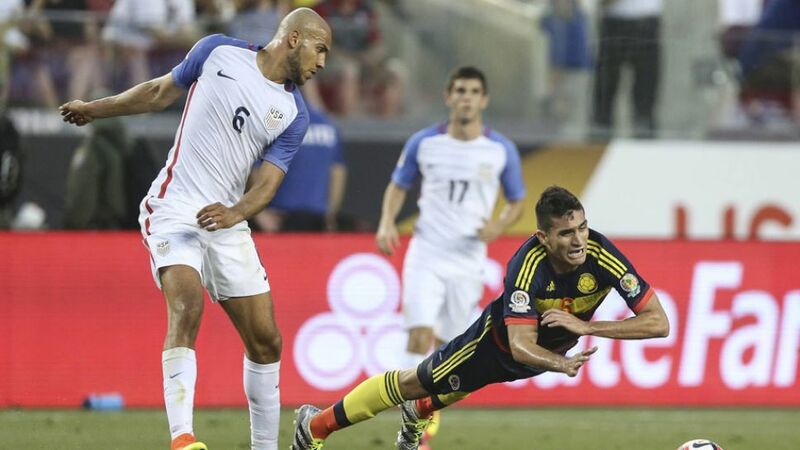 Hertha Berlin's John Anthony Brooks (l.) has played every minute of the USMNT's run to the Copa America Centenario quarter-finals. Bundesliga trio John Anthony Brooks, Fabian Johnson and Bobby Wood look set to start for the USMNT as Jürgen Klinsmann’s men chase a place in the semi-finals against Ecuador at the Copa America Centenario on Friday. "This is a really exciting time now," said former VfB Stuttgart and FC Bayern München striker Klinsmann at his pre-match press conference. "The knockout stage is a completely new tournament. It's do it or go home." Klinsmann may regard the quarter-finals as distinct from the group campaign, though consistency has been key for US coach throughout the competition. Despite losing 2-0 to Colombia on the opening day, Klinsmann stuck with exactly the same starting line-up for the next two games, earning back-to-back wins over Costa Rica and Paraguay to finish top of Group A. In Hertha Berlin centre-back Brooks and Borussia Mönchengladbach utility man Johnson, the US defence is underpinned by two of only six players in the 23-man squad who have played all 270 minutes of the tournament so far. The US had not started with the same side for three consecutive games since the 1930s, but there will be at least one change on Friday, with DeAndre Yedlin's suspension meaning Johnson could switch from left-back to right. Brooks in particular has impressed in the United States this summer, putting in a man-of-the-match performance as the Americans beat Paraguay 1-0 last Sunday. "I think John over the last two or three years had his ups and downs, little roller coasters like youngsters in general have," said Klinsmann. "But he stayed very determined, very committed to what he is doing. I think he's just now realising the sky is the limit for him. We are very optimistic about his future." Ecuador qualified as runners-up in Group B with an undefeated record which included a goalless draw with surprise tournament casualties Brazil, but Klinsmann remains optimistic of setting up a semi-final clash with either Argentina or Venezuela in Houston on 21 June. "You go through every position and we are there, we can absolutely compete with these guys," he said. "Now it's down to momentum."